Calabria Bike Resort - Bike Always! Are You Ready For Your Special Day Ride? 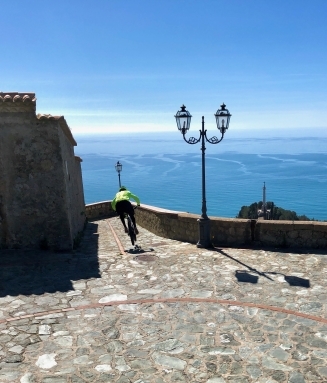 The Calabria Bike Resort is a bike park located in south Italy in an amazing naturalistic place from the mountains to the sea. If you are MTB enthusiat, you can enjoy with many trails across wild woods, pristine mountains, lovely historic village, up to the Tyrennian Sea with its famed beauty. It will be an unforgettable experience for all bikers, rookie and professional. More than 1.500 meters of difference in height and more than 32 Km squadred area all togheter will be the best way for satisfy your passion. Calabria Bike Resort offers many choices for your holiday. Through our website you can choose your accommodation in hotel, B&B or flat. Visit our platform to book. With the Bikepass you can enjoy your ride at the best. A shuttle service pick you and your bike up; from sea to sky. Imagine how can be fantastic to wake up in the morning and a shuttle are waiting you and your bike. Book trough our website to make it possible, free! Landed in Calabria? Contact us if you need a transfert to bike resort. Airport or railway station are not a problem. Less than 40 minutes to be here. It can be dangerous ride our trails if you are not confortable riding a bike. We prefer rider with their own bike.